•	I am a hard-working nanny who takes her responsibilities seriously. I always aim to work closely with parents, and try to be sensitive to the needs of each family and children in my care. •	I am fun-loving with a good sense of humour and believe it is important to have fun with children and encourage them to be happy, joyous and learn through play. •	Making sure that I provide the age-appropriate activities suited to support the all-round development of each, I tailor activities to the interests and needs of every unique child. •	I pride myself on being active and ensuring children have lots of social engagement such as taking babies and children to baby gyms, toddler groups, music sessions etc. I also enjoy participating in outside pursuits with the children such as outings to the park and city farms etc. •	I am especially creative and enjoy providing arts and crafts activities at home such as box-modelling and creating art from household items which all children love and it encourages their imagination and creativity. •	I have worked with families from a variety of different cultures and backgrounds and endeavour to be sensitive to both the needs and wishes of parents and children. •	I am currently seeking a part-time nanny position, following a four-year placement with a family whose youngest child is now starting school and no longer requires a nanny. •	I have over 10 years’ experience worked as a nanny, since 2008. In addition, I am a qualified nursery nurse with over 29 years’ experience of working with children and families in a variety of settings with excellent references. •	I have an enhanced CRB and I am a registered Ofsted nanny. I have a first aid certificate and driving license. •	I have also worked for many years in a mother and baby unit supporting mothers in the early stages of parenthood. My work experience has also included working in nurseries, schools, under five centres. •	Most recently, I was a nanny to two children; a girl aged seven and a boy aged four. The boy has just started school this September, hence this position has come to an end. I have been with this family for four years and have excellent references and come highly recommended by the family and continue to have a relationship with the children even after my role has come to an end. •	Nanny to a 3-year-old boy, working 3 full days a week, providing all-round care, fostering all-round development, educational activities, outings etc. Position came to an end when the child went to school. I have excellent references available. •	Nanny to two girls; aged 9 and 4, working 3 days a week, providing educational activities, outing’s play dates etc. The position came to an end when the younger child started school. Excellent references available. •	Nanny to 3 children ages 10 months, boy five, girl 6. I worked as their nanny for two years on a part time basis. Tuesdays to Thursdays. I left as the youngest child went to full time nursery. Again I have excellent references. •	Nanny to 2 children: one 10 months old, and one 6-year-old. Position ended as mother was made redundant. Excellent references available. •	11 years’ experience in mother and baby unit, working as a social care practitioner, bank staff. Position came to an end when I took up a nanny position. The mother and baby unit closed in August 2014 Excellent references available. •	Following role as a nursery nurse, I was approached by a parent to work as a nanny for their 2 children, as I was boy's favourite carer at the nursery he attended. •	8-month-old baby, boy of four. left as family relocated to outside London area. •	6 years’ experience at Gillespie primary school, working as a nursery nurse planning and implementing educational activities for children aged 2yrs to rising five. I am available for 2 or 3 Full days a week, working as a part-time nanny. Also available for babysitting while I am looking for a nanny position. Below are the latest reviews for Fiona W. Please note that reviews represent the subjective opinions of other Childcare.co.uk users and not of Childcare.co.uk. Parents must carry out their own checks and references on childcare providers to ensure that they are completely happy before enaging in the use of their services. Fiona, was quite simply the best nanny we ever had. She is truly exceptional. She is very hard working, punctual, loving and exceptionally kind to my son. My son truly flourished under her care. She always endured he had a rich variety of stimulating activities to do, especially creative play. I will never forget coming home from work one day to see a model of a witch’s ‘Room on a broom’ including a broomstick, frog, cat, bird sculpture that was made out of cardboard and painted beautifully. Once I can home and they had created a Chinese dragon to celebrate Chinese New Year. My son started school and sadly our time came to an end. She really is a magical Marry Poppins. I would not hesitate to recommend Fiona as a nanny, it will be a very lucky family that get to have her join their family. I still miss her to this day. Fiona has been an exceptional nanny to our two children (now 7 and 4) for almost four years. Fiona has a great sense of humour and has provided a warm, nurturing and fun environment for our children who both adore her. She is wonderfully creative and our children have had fun creating so many different art projects with her. 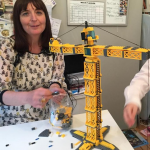 Fiona has supported our children from toddling and messy play through to support with reading and homework in an engaging way, with an excellent understanding of the changing needs of children through the different developmental stages. I am sure Fiona will have a tremendously positive impact on any family with whom she takes up a position as a nanny.